What’s the Best Time to Travel to South Beach, Miami? The FedEx Orange Bowl and the Orange Bowl Parade start out the year for the Miami-area sports fans and millions of people who watch them on TV. Also, in January in the Miami area is the Art Expo which features live music and artisans selling their wares the second week in January. South Beach’s Art Deco Weekend is a celebration of Art Deco, with antiques for sale, music performances of music from the Art Deco era, and history lectures. This is a fantastic time to visit South Beach Miami. The third week in January features Art Miami at the Miami Beach Convention Center. There are dealers from all over selling art to collectors and exhibitors. There are new talent showcases for emerging artists from Latin America and the Caribbean. Also, for art lovers and collectors, there is the Beaux Arts Annual Festival of Art Weekend the third weekend in January. It’s at the University of Miami, not in South Beach proper, but you can get there via taxi or rental car from South Beach Miami. Map geeks, take note. A very specific crowd will be interested to know that the Miami International Map Fair takes place the first weekend in February in the greater South Beach Miami area. It’s put on by the Historical Museum of Southern Florida and beckons to collectors, enthusiasts, dealers and the curious from around the globe. You can just look, or you can purchase items. The FIU Miami Film Festival, sponsored by Florida International University features up to 30 films from around the world in 10 days starting in the last week of February and continuing into March. Close to 50,000 people descend on South Beach Miami for the galas and parties after the films which are shown at the Gusman Center for the Performing Arts. You’ll see directors, actors, and maybe even a few stars. Carnaval Miami is a big deal for about a million people each year in Miami’s Little Havana. It’s easily accessible from South Beach Miami. All sorts of events take place, including beauty pageants, Latin performers all week long for the Noche de Carnaval, cooking contests, and the Calle Ocho Festival which is a 23-block long festival of dance, food, and entertainment. The Miami International Orchis Show draws people from all over to Coconut Grove, which is a short distance from South Beach Miami via rental car. Golfers flock to the area for the Genuity Championship at the Doral Golf Resort. Sports fans will also want to know about the NASDAQ-100, one of the top tennis events in the nation. The South Beach Film Festival is one of the best weeks to visit South Beach Miami. Check out the independent films showing at the Colony Theater on Lincoln Avenue. The South Beach Dive & Seafood Fest is held the first weekend of May. If you’re here in mid-April for the South Beach Film Festival, then you may want to stick around for this one. Where else can you get sandcastle-building contests, an underwater film festival, and diving in the warm ocean waters off South Beach? The Miami Beach Cinematheque hosts the annual Sicilian Film Festival features documentaries, shorts, and animation. If you’re in South Beach Miami in June, you might want to rent a car and head to Coconut Grove for the nation’s largest black heritage festival. It’s the Miami-Bahamas Goombay Festival and it draws over half a million people over three days of events. One special feature is the Royal Bahamas Police Band. There’s food, dancing, and parades to enjoy. 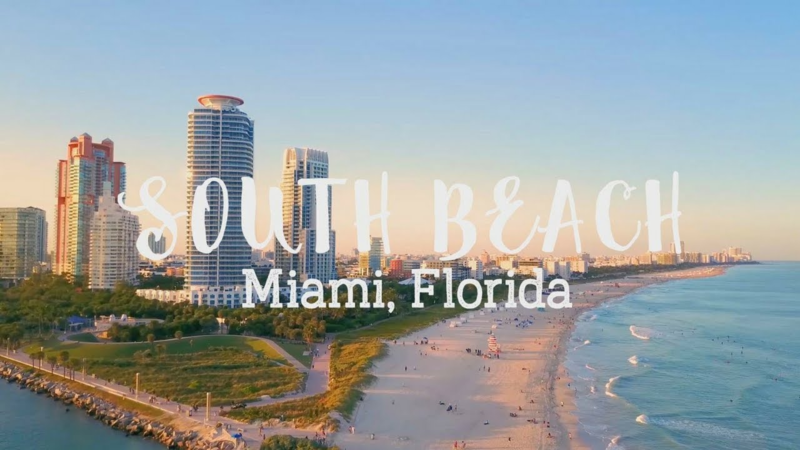 Another South Beach Miami area festival is the Florida Dance Festival which features dance competitions amongst dance companies from all over the U.S. The Brazilian Film Festival is one of the largest such festivals in the country. They show more than 30 Brazilian films and the big directors, actors and producers show up. At North Beach Bandshell, 7275 Collins Ave., Miami Beach. The annual City of Miami Beach Fourth of July Celebration is at Collins Avenue and 72nd Street – Miami Beach, FL 33140. It’s on the beach and begins at 7 pm. There’s a swearing-in celebration for newly naturalized citizens, then a concert than the big fireworks display, all at Miami Beach. America’s Birthday Bash or Fourth of July celebration is held at Bayfront Park, (301 N. Biscayne Blvd. – Miami, FL 33132) in the South Beach Miami area. 4 to 9 pm. The fireworks explode over Biscayne Bay. There are rides, music, food, and fireworks. Key Biscayne also has its own 4th of July Parade & Fireworks Display, all starting with the parade at 11 am. Pick your spot-on South Beach and soak up the entertainment in the night sky. Fashion Week Miami Swim is at the Raleigh Hotel – 1775 Collins Ave. – Miami Beach, FL 33139. Each year there’s a different sponsor, so the name of the show changes each year: like Mercedes-Benz Fashion Week Miami Swim, for example. But it’s always at the Raleigh, and it always features the hottest fashion in the hottest city. Hot social events and parties all week, including the kickoff party at the Raleigh, plus live performances by top bands (like the Beach Boys). Shows are by invitation only but the rest of us can have fun just being there for fashion week. Miami Salsa Congress at Miami Beach Resort & Spa – 4833 Collins Ave. – Miami Beach, FL 33140 four days of total salsa: workshops, live bands, trade show and lots of dancers in town. International Gem, Bead & Jewelry Show at the Miami Beach Convention Center. Looking for jewels? This is three days of browsing jewels, accessories, jewelry, and special exhibits. Summer and early fall are lazy, quieter times in South Beach, although in comparison to other times of the year. Somehow, South Beach Miami manages to party on no matter what time of year it is, but it does slow down a bit now. If you’re here in September, and you like music, you can check out the Festival Miami, run by the University of Miami School of Music. It lasts for six weeks and you can catch all sorts of traditional, symphonic and chamber music concerts. Sometimes famous names show up to do a show, so keep your eye on the schedule. Miami International Wine Fair at the Miami Beach Convention Center. Taste 1000 wines and local food at this wine-lovers’ convention that benefits the American Red Cross. The Hispanic Heritage Festival is an old cultural festival that’s been taking place for years now. It’s the whole month of October and one of the highlights is Discovery of America Day (formerly known as Columbus Day). Street parties and food festivals abound. Easily accessible from South Beach Miami. Film buffs check out the Italian Film Festival at Regal Cinema South Beach – 1100 Lincoln Rd. – Miami Beach, FL 33139. It’s a new film competition with awards on the last day. Shorts, seminars as well in this annual tribute to the Italian Master of Film and newcomers as well. The IFE Americas – 10th America’s Food & Beverage Show is for those wanting to sample foods from all over the world. It’s at the Miami Beach Convention Center. The Miami Beach Antique Jewelry, Watch & Fine Silver Show is at the Miami Beach Convention Center. You can browse antique jewelry etc. from all corners of the globe. Art lovers have another reason to visit the South Beach Miami area now, for the South Miami Art Festival. It’s on Sunset Drive in Miami, a short drive over the bridge from South Beach Miami. The South Florida Auto Show is at the Miami Beach Convention Center. Big names in car manufacturing showcase their upcoming models for the year. Attendees can also buy all sorts of car stuff too. The Miami Book Fair International lasts 11 days, before Thanksgiving and draws people from all over the world to its book exhibitions and author’s congress. There are rare booksellers here too. It’s downtown Miami, a quick hop over the bridge from South Beach Miami. Tennis fans will want to visit the South Beach Miami greater area for the annual Junior Orange Bowl Festival held each year all over the Miami area. It’s the largest international youth sports and arts festival. It’s held October through January with most events occurring in December. There are cultural activities like chess and photography as well as traditional sports events like basketball and tennis. There’s even a Junior Orange Bowl Parade the week after Christmas, in Coral Gables which is not in South Beach Miami but is nearby and easily accessible from South Beach. Art Basel Miami Beach is an annual event that showcases art from 20th and 20st century artists from around the world. It’s a big event-art show that’ well known and very popular. The festival also features crossover events such as film, music parties, design, and architecture show. Art Basel Miami is the sister event of Art Basel in Switzerland. Galleries from all over the world will exhibit art from Latin America, North America, Europe, Asia, and Africa. Artists are both well-known and starting out. Videos are also shown at the galleries. It’s a huge art and social event, and one of the top gatherings for the art world in December. Bayfront Park’s New Year’s Eve gates open at 7 pm at Bayfront Park – 301 N. Biscayne Blvd. – Miami, FL 33132. Live music starting at 8 pm and midnight fireworks to bring in the new year. So, there you are — a calendar that’s rich with opportunity for all sorts of travelers who find themselves heading toward South Beach. Get planning, don’t forget your flipflops, and have fun!